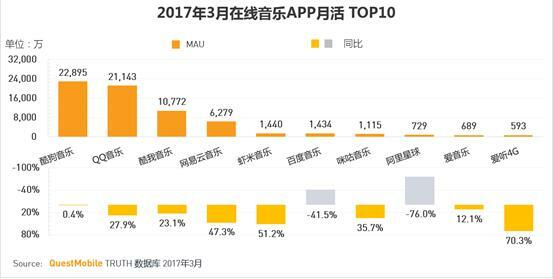 Tencent-backed music apps KuGou (酷狗 in Chinese), QQ Music (QQ音乐) and Kuwo (酷我) were the three most popular music apps in China in terms of monthly active users (MAU) in the first quarter of 2017, according to a report recently released by mobile market research firm QuestMobile (in Chinese). The entries of internet bigwigs such as Tencent, Alibaba, Baidu, and NetEase have served to create the patchwork pattern of the mobile music streaming market. Tencent-backed music apps include QQ Music, KuGou, Kuwo and Duomi (多米 in Chinese), while Alibaba owns Alibaba Planet (阿里星球) and Xiami Music (虾米音乐). Baidu’s music app Baidu Music merged in 2015 with the Taihe Music Group. NetEase Cloud Music, the music and radio arm of Chinese internet portal NetEase, was the fourth most popular music app in Q1. It was thrust into the limelight again after it announced this month the completion of its series A worth RMB 750 million (around US$ 108 million). The round puts the company’s valuation at RMB 8 billion. It’s worth noting that Tencent’s KuGou and QQ Music each gathered over 200 million monthly active users and the internet giant’s Kuwo has an MAU of 100 million. Although China’s mobile music streaming market has been long favored by investors, users’ reluctance to pay for music is still a pain in the neck. Currently, Chinese mobile streaming services have been trying to monetize their user base through various approaches ranging from paid subscription, digital albums, ads, in-app gaming, to sale of artist merchandise. In addition, major music streaming services also form partnerships with artists and launch O2O events together to allow music fans to pay to watch the live stream or the footage of concerts. An industry observer predicted that the “fan economy” could be the main growth driver of the mobile streaming market, which is estimated at RMB 8.68 billion by the end of 2016. He also advises that major players should provide more differentiated services that match the needs of music streamers.